Communist Party (Turkish: Komünist Parti, or KP) is a communist party inTurkey founded in 2014. Following a period of internal strife within the now-defunct Communist Party of Turkey (TKP), the party decided to split in two. 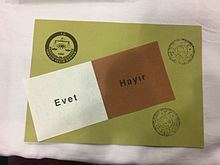 On 15 July 2014, the two rival factions reached a consensus to freeze the activities of the former party and that neither faction shall use the name and emblem of TKP.The faction led by Kemal Okuyan and Aydemir Güler founded the Communist Party on 17 July 2014, with the other faction forming the People’s Communist Party of Turkey(HTKP).